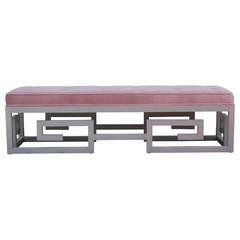 The Fleure Bench, with its impeccable fluted detailing compliments one of our signature pieces, the Fleure sofa. Shown here upholstered in Designers Guild Granite cotton velvet. The feet are shown in natural oiled walnut; a finish that accentuates the natural beauty of the wood. Construction: Solid seasoned beech and ply frame, webbed and individually fluted seat. The feet are in solid Walnut or Oak. Each Stuart Scott piece is built by hand in our workshop in Wiltshire, England. Nothing is mass-produced. This ensures complete attention to detail, structural integrity and sheer build quality. We never compromise. When we finish each piece, it is signed and numbered: a unique hand-made masterpiece. Exclusively available in Designers Guild Cotton Velvet. Available in 8 colours: Varese Cameo, Clover, Teal, Denim, Granite, Terracotta, Ochre, and Cassia Kingfisher. Customers can also choose from the following feet finishes: Oak - Oiled, Aged or Ebonised. Walnut - Oiled, Ebonised or Black lacquered. 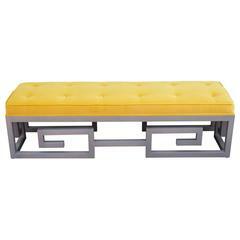 A vintage pair of painted and striped scroll benches reupholstered in gray velvet. Good vintage condition with age appropriate wear. Some scuffs to the wood. 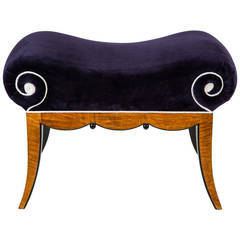 Small saddle bench upholstered in black patterned velvet with fruits. Tapered square wood legs with stretcher finished in grey oil paint. Fun and funky. Made by us in Norwalk CT.